There are times I wish I hadn’t set a precedent of cooking from scratch every night. Tonight was one of those nights. All I wanted to do after work was heat up some oven chips and make some chip sandwiches. 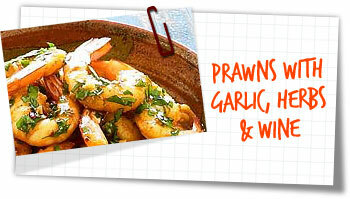 Sadly oven chips do not exist in my house, so after a little scour in the freezer I happened upon some prawns. I wasn’t particularly hungry either so I decided on this really simple little snack! A really easy litte starter or tapas dish. It’s so quick to make and the taste is surprisingly delicious. Less time in the kitchen, more time in front of the TV – lovely. Season the prawns with salt & pepper and set aside. Heat a frying pan with the oil over a moderate/high heat. Add the garlic and sizzle for 10 seconds. Add the prawns and stir for 30 seconds. Add the basil and then the wine and let it sizzle for 1-2 minutes to reduce the wine by about 1/2. Check for seasoning and serve immediately. You can even serve direct from the pan for a more rustic affair. Serve as a hot tapas with lots of bread to soak the wine sauce up. You can use other herbs, such as oregano, sage, thyme or tarragon.